A Gayle Force: Questions Answered! Yesterday I just wasn't quite feeling like life. Ya know? So I left it up to you -- the people -- to ask me anything you wanted. I fully expected to not have anyone ask me anything, so I really appreciate that I don't look like a complete idiot today. Thanks! Now...for my answers. Beth asked: How'd you get into blogging and what's your favorite part about it? How did you get your little pup? I'm not really sure what prompted me to start blogging. I think I had a general idea of what it was and I decided I wanted to do it too! I never kept up with it, so this is really round four of trying. So far so good! My favorite part (as cliche as this is) is meeting other bloggers. Whether actually meeting them in person, or meeting them online and forming friendships, I love it all. I also love being able to have a platform to express myself every day, whether people read it or not. I got my pup from a breeder in Baltimore. There's actually a long story behind it, so maybe I'll post the specifics one day. It took some convincing and about two years of waiting. Stephanie asked: What's your favorite tv show? What food will you never ever eat? Where are you going on your next vacation? Hmm. My favorite tv show is probably The Walking Dead. I also love Glee because I have a performing arts background, but the drama on that show is getting really old. I will NEVER eat raw fish, so that leaves out most sushi. It's non-negotiable. I've had a few vacations recently, so I'm not sure where the next one will be. I will be going to Florida in May for a wedding, so I guess that counts. Mia asked: What's your favorite book and/or author? That's a really difficult question to answer. I think my favorite book is The Catcher in the Rye. Or Grendel. Both are totally awesome. As for a favorite author, I'm not sure I have one. I've been reading a lot of Sarah Dessen books lately (a young adult lit author), so maybe we'll go with that. Background info: I originally studied education and had to take a YA lit class; I've always loved that genre, but that class made me love it even more. So usually I gravitate toward those books. Yes, I know I'm 23. I don't care. Ashley asked: What is the last movie you saw in theaters and do you recommend seeing it? The last movie I saw in theaters was Burt Wonderstone. NO. I don't recommend it. It wasn't funny and it was slow. I was truly disappointed. My favorite shopping websites are Amazon and Etsy. Pretty predictable, I guess. 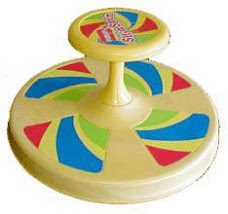 My favorite toy used to be the sit-n-spin. I wish they made them in adult sizes. Seriously. This looks exactly like the one I used to have. 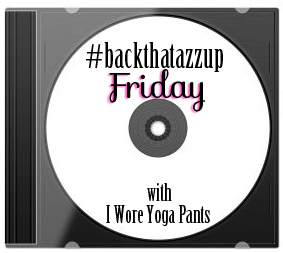 Aaaaaand because it's Friday, it's automatically #backthatazzup Friday. So here's what I've been listening to. Can't go wrong with a YA book! :) And I just saw Burt Wonderstone last night! I really liked it, but I usually tend to think movies are funny that no one else does. I'm 29 and YA dystopians are my favorite! Thats too bad about Burt Wonderstone, I haven't seen it yet but the trailers looked good! I really like the Walking Dead too! And it's weird, because I wouldn't consider it my normal type of show...but it's so good!!! I'm a new follower from The Collective Hop.